Alliance S2A and SC-200 conditioners offer built-in null indication and front-panel pushbuttons. 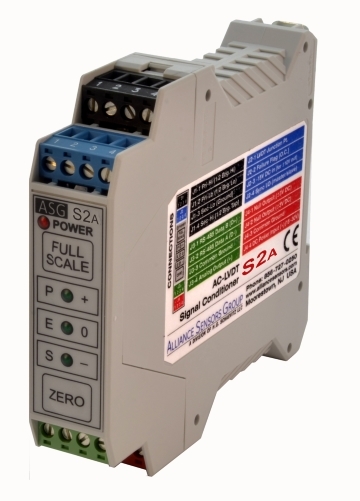 Alliance Sensors Group released its S2A and SC-200 DIN-rail-mounted LVDT signal conditioners. The conditioners offer built-in null indication and simple front-panel pushbuttons to set zero and full scale. Calibration time is now reduced from at least 20 minutes per channel to just a minute or two. The conditioners feature power inputs from 15-30VDC or ±15VDC and a choice of 6 voltage and 2 current loop analog DC outputs. In addition to built-in cyber security and diagnostic features, the series offer a choice of 4 LVDT excitation frequencies. It also features auto-mastering and an RS-485 digital communications link with an available GUI and hot swapability.